Ultra Glucose Control is formulated for the nutritional management of glucose response. 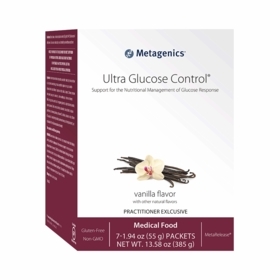 It is designed for individuals who may need additional support in controlling their blood sugar levels. Ultra Glucose Control delivers a ratio-balanced combination of carbohydrates, protein, and fat (40-30-30) to manage glucose response, consistent with recommendations from clinical centers. Formulated with MetaRelease™—a propietary blend of slow-release, complex carbohydrates (UCAN SuperStarch®*) and fiber—along with high quality proteins and branchedchain amino acids, Ultra Glucose Control supports a balanced glucose response and sustained energy release.